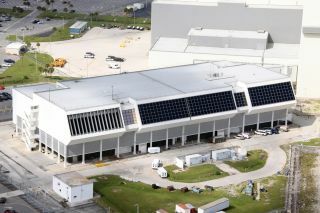 The Launch Control Center (LCC) at NASA’s Kennedy Space Center in Florida is listed on the U.S. National Register of Historic Places. It is now being opened for public tours for the first time in more than 30 years. The NASA control center that gave the command to launch rockets to the moon and send space shuttles into orbit will be opened for public tours this week for the first time in more than 30 years. NASA's Kennedy Space Center Visitor Complex in Florida announced that beginning Friday (June 15), a limited number of daily tours will take guests into the spaceport's historic Launch Control Center (LCC). Tour-goers will have the rare opportunity to enter the room where directors and engineers supervised the countdown for all 152 launches of the Apollo moon landing and space shuttle programs. "This is [a] rare opportunity that NASA has worked with us to provide — access to the Launch Control Center," Bill Moore, chief operating officer of visitor complex, said in a statement. "It might be another 30 years before guests will receive a behind-the-scenes opportunity like this again." The KSC Up-Close: Launch Control Center (LCC) Tour will run through the end of the year. It costs $25 for adults and $19 for children in addition to the regular admission to the visitor complex. The new tour takes visitors inside Firing Room 4, one of the Launch Control Center's four firing rooms and the one from which the final 21 space shuttle launches were controlled. Visitors will also enter the "bubble room," with its wall of interior windows through which the Kennedy Space Center management team viewed what went on in the firing room below. "With so much on the line, the people who worked in this room were under tremendous pressure not only in daily operations but particularly as the countdown proceeded," Bob Sieck, a former launch director, said in a statement. "They had to handle the tension and their emotions as the tests became faster, the astronauts took their place in the shuttle and thousands of people and news media were gathered outside to watch the launch." In addition to the "bubble" looking in, visitors will look out the LCC's iconic windows — windows "through which you could see mankind's future," said architect Martin Stein. His concept for the LCC won an award for industrial design from the American Institute of Architecture in 1965. In addition to the firing room, the tour also showcases the LCC's lobby, which features 152 wall plaques — one for every mission guided there since its first, the unmanned Apollo 4 in 1967. Included are the manned Apollo moon missions, the international Apollo-Soyuz Test Project in 1975, the Saturn rocket launches for Skylab space station in the mid-1970s, and the launches for the 30-year shuttle program. The tour also includes drive-by views of one of the shuttle launch pads and then ends at the Apollo/Saturn V Center, where guests can see one of the three remaining Saturn V rockets, and then join the visitor complex's regular tour. The Launch Control Center Tour is the second in a series of rare access tours celebrating Kennedy Space Center's 50th anniversary. NASA and the Kennedy visitor complex recently extended its first behind-the-scenes tour through the end of 2012. That tour, which began in November 2011, takes visitors inside the 52-story tall Vehicle Assembly Building, the massive building adjacent to the LCC where the Apollo Saturn V rockets and space shuttles were assembled. Both the LCC and VAB tours are possible in part due to a lull in crewed launches from the Kennedy Space Center. After retiring the space shuttle last year, NASA has been working toward developing a new heavy-lift rocket to take astronauts beyond Earth to the asteroids, the moon, and eventually, Mars. This Space Launch System, with its Orion multi-purpose crew vehicle, will be assembled for launch in the Vehicle Assembly Building and controlled from the Launch Control Center. NASA is also hiring commercial launch companies to take its astronauts to the International Space Station. Those flights could also be controlled from the LCC. For more about the KSC Up-Close: Launch Control Center Tour or to purchase tickets, see the NASA Kennedy Space Center Visitor Complex website.